Culture promotes a lifestyle of imitation, whether that is our favorite preacher, author, or movie star. Paul instructed the church in Corinth, “Be imitators of me, as I am of Christ,” (1 Corinthians 11:1, NRSV). Yet somewhere along the way, imitating Christ became the equivalent of following a rigid formula that strips us from our creativity and individuality. Is it possible to become imitators while maintaining true to our originality? I do not think it was Paul’s intention to create a homogeneous group of Christ followers, nor do I think that is the aim of churches or seminaries. Yet somehow, imagination and authentic dialogue have the tendency to be set aside. I spent years interning with the middle school department at my church, and when they offered me the associate youth minister position I arrogantly assumed the transition would be smooth sailing. Yet, after a semester of what felt like pulling teeth and climbing razor wire, I felt like a failure. At the time, I thought I was following the well-laid formula for youth pastors: a game, some music, a lesson with a clear-cut application, prayer requests and dismiss. As I began to navigate my newly acquired role as the middle school minister, what I slowly discovered was that mimicking my predecessors was not going to work. I brought this frustration to middle school ministry. After each Wednesday night, I concluded that the service went as well as could be expected. However, in the depth of my being, I knew something was off. I was not being true to myself as a minister, and was in turn withholding my best from the students. I would talk to them about the importance of finding spiritual practices that resonated deeply to them and insisted they had an important role in God’s story, yet I failed to make this connection in my own life. I was so concerned with cloning the Wednesday night programs I observed as an intern that I neglected my passions for dialogue and leadership development. This is not to say the methods I attempted to mimic could not meet these goals, only that I could not use them and feel that I was serving in a way congruent with my gifts and personality. I embarked on a quest to facilitate dialogue and to equip students to interpret Scripture for themselves. Instead of standing on a stage instructing students about what the Bible says, we now sit in circles where we ask tough questions and talk about what the passage means to each other. Instead of telling the students that their opinions are important, I allow them to shape discussion and offer their unique perspectives on the stories we are reading. I entered the journey well aware that this redirection could fail. Dialogue can be difficult, and dialogue with a group of middle school students seemed downright impossible. However, I am continually overwhelmed with their profound honesty and insight. The Bible instructs us to be imitators of the Divine, but that does not mean we are to become clones. Each of us has unique characteristics that exhibit God’s wideness. We do ourselves and our community a disservice when we try to be someone we are not. Though I am just at the beginning stages of ministry, I am reminded constantly that when I am true to who I am, God is able to accomplish far more than I could ever imagine. Brittany McDonald-Null is a CBF Leadership Scholar and a third year divinity student at Logsdon Seminary in Abilene, Texas. 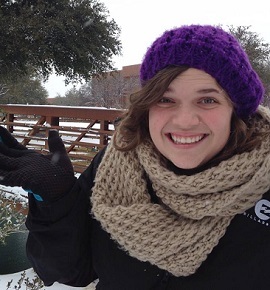 Brittany also serves as the associate youth minister at Pioneer Drive Baptist Church in Abilene.